Getting familiarity with important business cloud terms helps in following up all industrial developments. These terms are going to help you out in keeping your core focus to all important conversions. As everyone knows that the cloud is nowadays has become an essential part of our daily business functionalities. Therefore, it is important for every Non-IT experts to get an acknowledgment of all important and mostly used technical terms. It benefits them in successful cloud migration and strategy development. Here are the few important terms for cloud business solutions one should essentially know. This is an abbreviation for Amazon Elastic Compute Cloud, EC2. Amazon EC2 is an important part of commercial web services by Amazon developers. It offers a high level of scalability according to your business requirements. It is easier to make changes in the capacity and processing power to best fit your requirement. Amazon Simple Storage Service (S3) is usually used for static hosting sites. It enables an easy, fastest and flexible access to cloud storage through any location. It is a highly scalable and most durable business cloud application. Amazon’s Relational Database Service (RDS) has enabled an easy setup, scaling, and operation of the relational database within the cloud. It is developed to identify the relations between storage information and the items in real time. Apache Hadoop is the collection of open-source software framework available in the market for scalable and reliable distributed computing. It is utilized for the easy processing of a large set of data. AWS is an organizational unit of Amazon that is offering a wide range of cloud services that are inexpensive and most reliable. It operates from 11 different geographical locations across Europe, Asia, Australia and South America. The content delivery network delivers web content users and different geographical location. CDN is usually utilized for B2B interactions in an effective speed and high traffic. This is an easy as well as a configured way to access the nearest server. Cloud portability is an ability to transfer data the application as well as data from business cloud computing environment to another. It enables an easy migration with minimum disturbance. Cloud provider is the company offering its services to provide a cloud based platform, infrastructure, application and storage to different other organizations and individuals. Cloud storage is a service provided by cloud-provider that enable the customers to save their data through easy migration through the internet or any other off-site storage system. Such storage systems are maintained through a 3rd party. The cluster is a set of associated computers that work together and viewed as a single system. Each node of the computer is set to perform the same tasks that are scheduled and controlled by the software. Cloudware is a software that executes on remote web servers. It enables an easy development, deployment, execution, and management of applications within the cloud. Cloudsourcing is the replacement of traditional information technology operations. It is a process which allows different cloud services and products in easy deployment and maintenance to outsource. These products and services are outsourced by different business cloud providers. Cloud providers are also focused to target individuals and offering cloud services for personal usage. For example Dropbox, Amazon cloud drive, iCloud etc. Load balancer offers its services to distribute application traffic across the number of servers. It helps in balancing the traffic to maintain capacity requirements for the website. It is dangerous to relay in a single server especially if your traffic is receiving a high level of traffic. Self-healing system own the ability to distinguish if it is not functioning properly and sure to make the necessary changes to restore operational functionality. These systems are cost-saving for maintenance problems and reduce service downtimes. VPC is utilized to separate the resources of the site including the application, platform, and infrastructure in the protected remote network. This separation is performed to define the isolation levels among organizations by using those resources. Virtual Private Network (VPN) connection allows the secure access of an organization’s resources from their remote offices. In business cloud computing this is a concept that allows the cloud provider to manage flexible computing powers at right time. The resources include in elastic computing are bandwidth, storage etc. Hybrid cloud is the grouping of public cloud provider with private cloud. it enables easy data and application portability. IaaS refers to cloud based infrastructure management services. It includes network equipment, servers, and software. The complete virtualized environment is given by the cloud provider. PaaS includes cloud computing services and the computing platform is provided by the cloud provider over the internet. SaaS makes it easier to install and execute software because the cloud provider delivers the complete software/application to the customer. 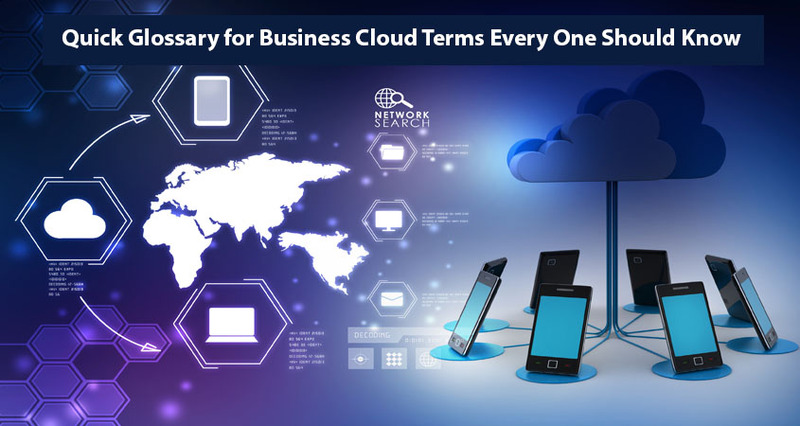 These are the significant business cloud terms that will surely help you in getting better insights and understanding with technological requirements.